The chaos of modern day Kowloon fills the space through which you walk. The nearby Chungking Mansions, a housing development from the 1960s, epitomizes the hustle-bustle of the densely populated peninsula. It also demonstrates the diversity of the population of Tsim Sha Tsui. Although the area is now more known for gold shops and milk powder destined for the Chinese mainland black market, it has a deep history of multicultural trade and the ethnic makeup of the southern part of the Kowloon Peninsula reflects that. Finally bursting through the sea of people, you find yourself standing before an oasis of tranquility. 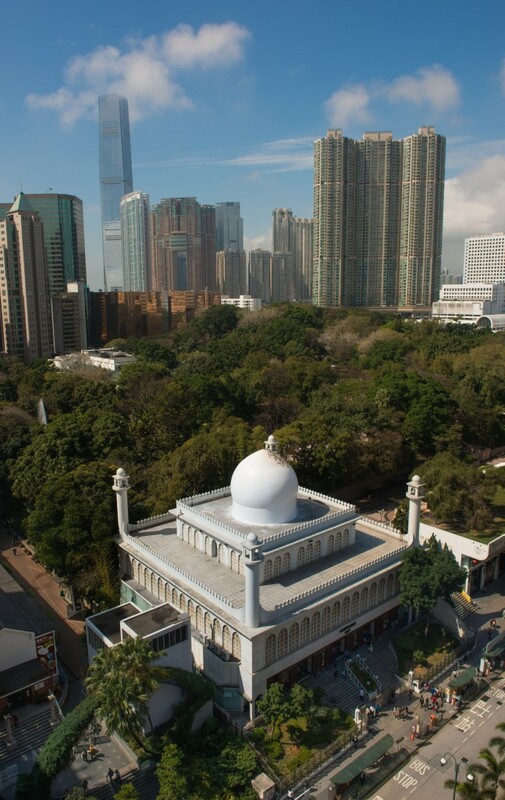 The domed white building that stands out amid the high-rise tower blocks is the biggest mosque in Hong Kong. 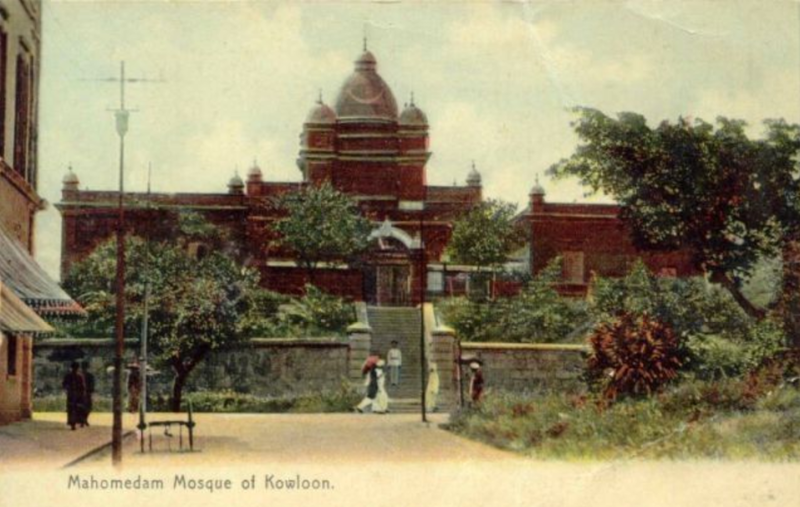 Serving the largest Muslim congregation of the region, the Kowloon Masjid is one of the most important religious structures in Hong Kong and a cornerstone of the Islamic community. The masjid (mosque) is a relatively modern structure built to replace an older one. The original, built in 1896, suffered structural damage to its foundations during the construction of the MTR and was torn down in 1978. The original was a red brick building that served the Indian Muslim soldiers based in Whitfield Barracks and was built under the supervision of Colonel E. G. Barrow by the Hong Kong Regiment. Construction of the new mosque, designed by I.M. Kadri, a famous Mumbai based architect, was completed in 1984. The new white building rests on a terrace and has four tall minarets (towers) and a qubba (central dome). Funded mainly by local Muslim Community and well-wishers who lived abroad and with some compensation money from the MTR Corporation, it cost HK$25 million to build the wonderful structure. The local Muslim community is of mixed origins, but the majority are of Pakistani heritage. Walking up the steps and removing your shoes, you seek out the manager of the masjid. Non-Muslims are allowed inside after informing the manager or Dawah officer however group visits are made after making prior arrangements. The manager takes you to see the Chief Imam, Mufti Muhammad Arshad. In his small office, the Imam tells you of the history of the masjid. Hailing from Pakistan, he has been the Chief Imam here for 14 years and knows his congregation well. 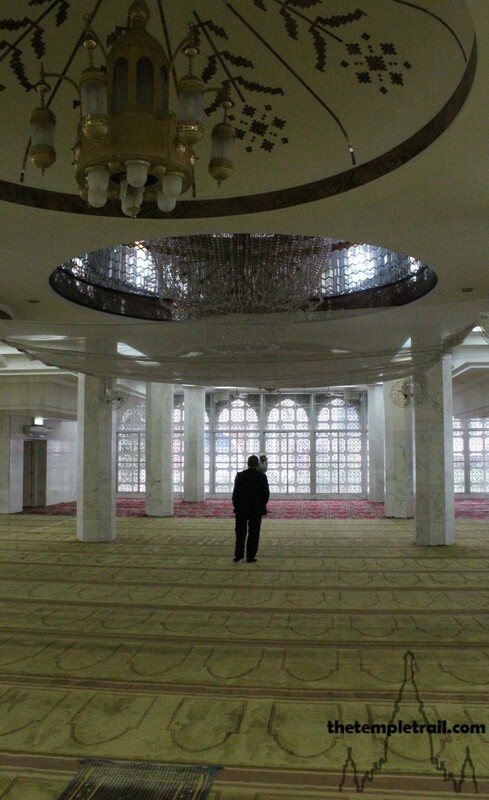 After a few minutes with him, you leave his company and find yourself in the main community hall on the bottom floor of the mosque. This large room is used for community activities, but is quiet at this time of the day. The rooms off to the side of the hall are offices and the library of the masjid. Back in the foyer of the building, you follow behind the groups of men ascending the stairs to the main prayer room with the Chief Imam. As you get to the next floor, you find yourself in a large, brightly lit room. 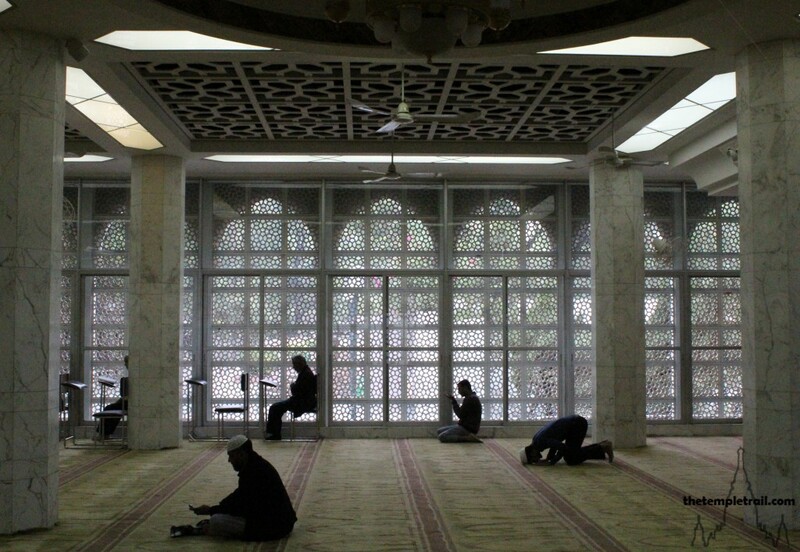 The musallah (prayer room) is surrounded by intricate windows that paint patterns of light into the space. 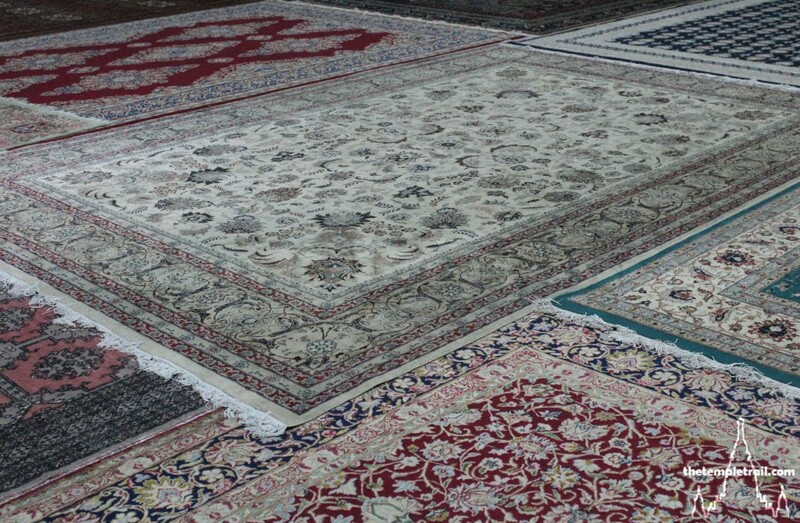 The Persian-style carpets at the back of the room add an air of the exotic. Standing at the back, you meet with friendly gestures of welcome from the congregated worshippers. A member of the Kowloon Mosque Management Committee (KMMC), explains some things to you before joining his fellow community members after the call to prayer. The Imam leads the Zuhr Ṣalāt (afternoon prayer) as you watch from the back. The lines of praying men, standing shoulder to shoulder, all move in unison, bowing and kneeling with rehearsed ease as the Imam prays. They all face the Qibla adorned with the miḥrāb. 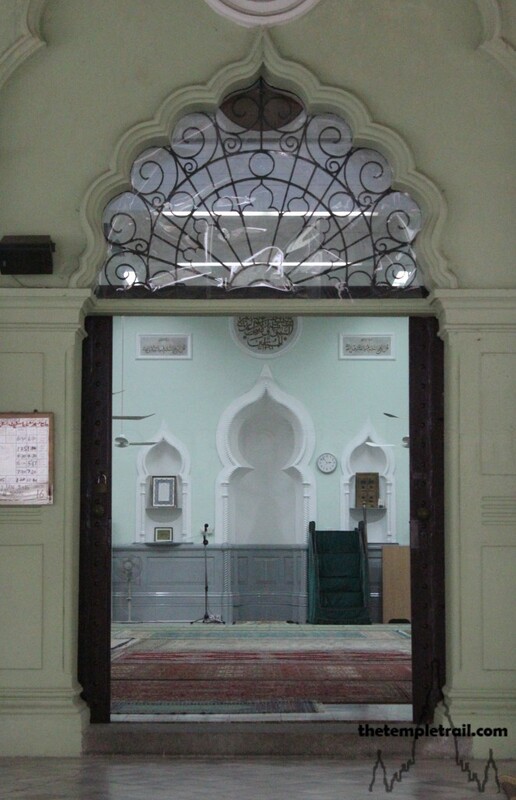 The miḥrāb is a door-shaped niche that indicates the Qibla (direction of prayer). Muslims pray facing the Holy Ka’ba, the most sacred building of Islam inside the Al-Masjid Al-Haram (the most sacred mosque) in the city of Makkah (Mecca), Saudi Arabia. All Muslims must make the Hajj (pilgrimage) to the Ka’ba once in their lifetime. By praying towards the sacred building, they confirm their international unity in the Ummah (community). There are five compulsory prayers a day (Fard Salat) and here at the Kowloon Masjid, the timing varies according to the season. Muslims offer 5 daily prayers, the first one (Fajr) is offered before sunrise, the second (Zuhr) after noon, the third (Asr) one and half hours before sunset, the fourth (Maghrib) immediately after sunset and the fifth (Isha) one and half hours after sunset. The sun dictates when the prayers take place, but the moon is what directs the timing of the most important festivals of Islam, Ramadan and Eid, as well as the Hajj. Sightings of the hilal (crescent moon) are taken as signs given by Allah (God) to begin the festivals. The Islamic calendar is lunar and it is for that reason that early Islamic scholars studied astronomy. As the prayer room empties after the ten minute Zuhr prayer, you have a chance to see more of the details of the space. Chandeliers hang from the ceiling and are adorned with khatati (calligraphy) of the Shahadah (testimony). It is the creed of Islam and reads ‘There is no god but Allah, Muhammad is the messenger of God’. Walking across the carpeted room, you see the silhouettes of a few remaining worshippers against the bright sunshine that pours in from the large windows. As you near the Qibla wall, you inspect the miḥrāb. It is actually intended to be arrow-shaped, pointing the way for the faithful. Next to the miḥrāb is the mimbar, a platform with chair from which the Imam delivers a sermon every Friday. Here, the mimbar is quite simple, but they can be quite elaborate and often have a long staircase up to them. At the Jumu’ah (Friday Prayer), the Chief Imam fulfils his role as the khatib (sermon giver). He sits on the mimbar and delivers a thirty minute khutbah (narration) to an average of 3000 people. While he does this, he holds a staff, symbolic of the staff held by the Prophet of Islam Muhammad (peace be upon him). The Muslims believe in the Holy Book Quran and they also believe in other three major Holy Books in addition the Quran, the first of which is the Tawrat, the Jewish Torah, or Book of Moses (Musa). The other two are the Zabur, the Book of Psalms of King David (Dawud) and the Injil, the Gospel of Jesus (Isa). In Islamic belief, these books came from the word of God, but have been corrupted over time. They believe that the Quran is the only true, uncorrupted word of God revealed by God to Prophet Muhammad (peace be upon him) through the angel Gabriel (Jibril). After spending a few more moments soaking in the atmosphere of the musallah, you thank your gracious hosts and leave Kowloon Masjid, inspecting the foundation stone of the original mosque that is found in the entrance hall. Walking down to the tip of the Kowloon peninsula, you jump aboard the famous Star Ferry. Crossing the harbour on the boat that is so symbolic of Hong Kong, you gaze over to Hong Kong Island and its high-rise towers. A few short minutes pass before you disembark at Central Ferry Pier and begin to cross the district. You take the Mid-levels escalator and you move efficiently above the streets of central Hong Kong. Your journey on the automated people mover takes you higher and deeper into the island and soon you find yourself near its terminus. 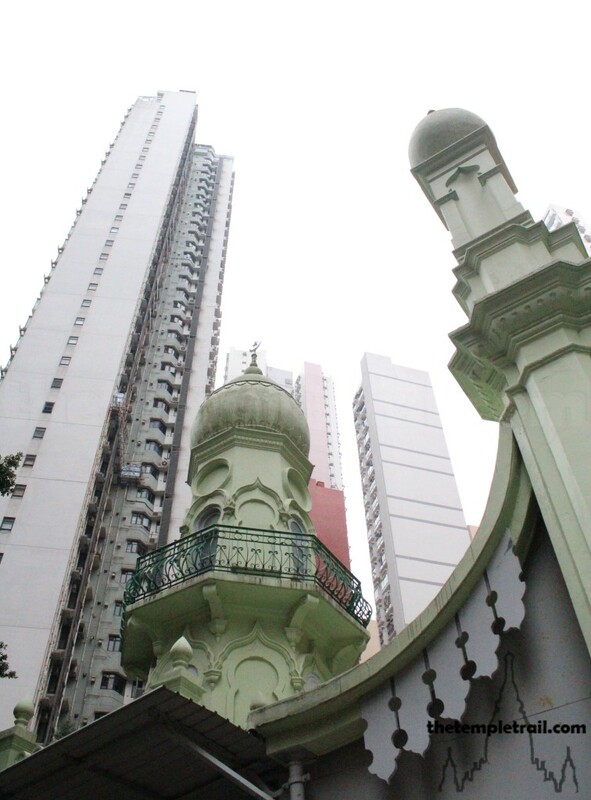 You are now on Shelley Street and at this high point above central, you stand before the gateway to the oldest mosque in Hong Kong, known today as the Jamia Mosque. 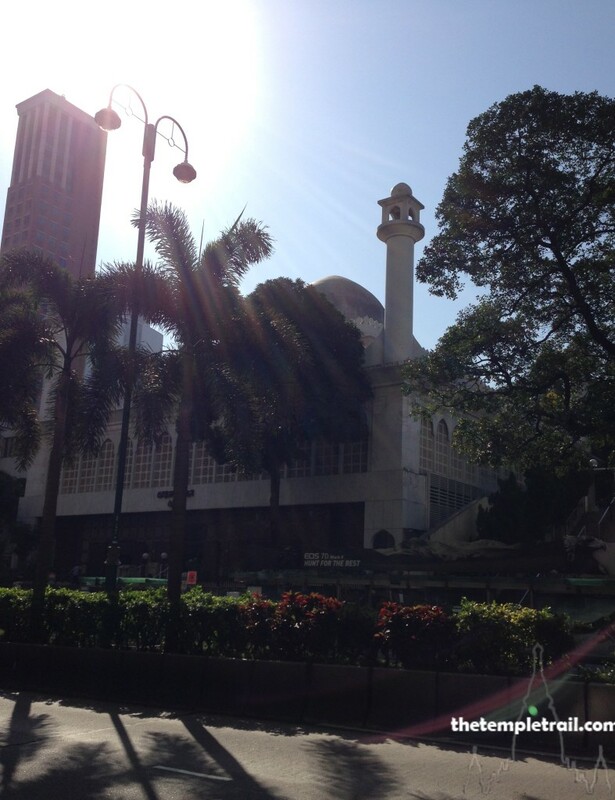 To understand the mosque, it is useful to know a little of the history of Islam in Hong Kong. The first Muslims to come to the territory were Lascars (sailors from Indian Subcontinent) who arrived in the early 19th century and had no permanent dwellings. They stayed together on Lower Lascar Row, and over time a community developed there. In old times, the area around Lower Lascar Row was known as the Moro Kai (streets of the people of the Moros). The Muslims held their first Jamia (gathering) in Lower Lascar Row. After the British took control of Hong Kong, more Muslims came from the Punjab to be policemen, guards and supervisors. Muslim soldiers came with the British Army and the various organizations banded together to form the Incorporated Trustees of the Islamic Community Fund of Hong Kong. 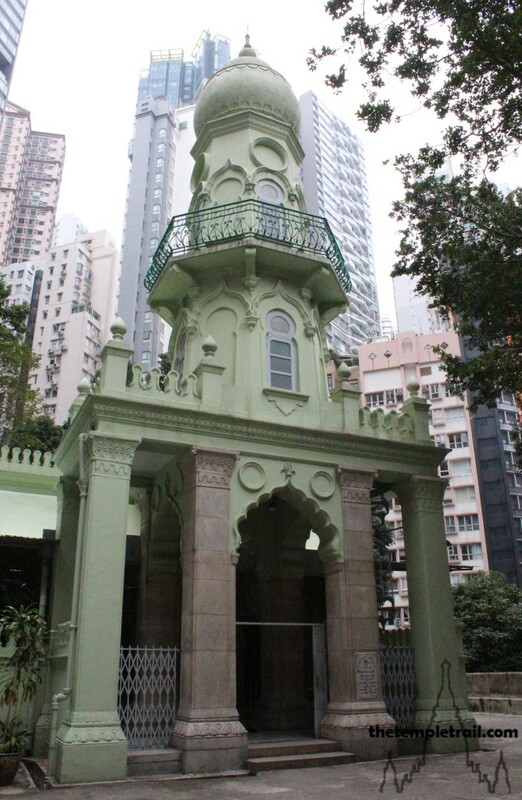 The Board of Trustees and the community leased this piece of land from the Government of Hong Kong in 1849 and an early incarnation of the mosque was built. 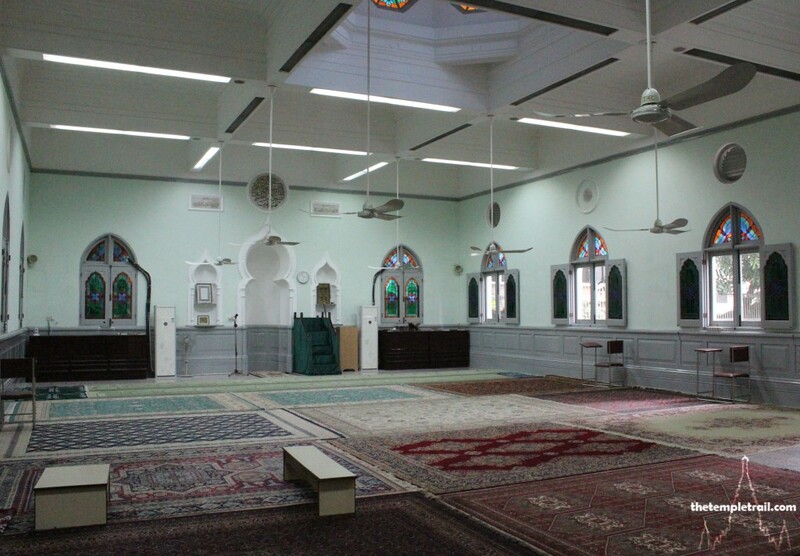 Eventually, with donations from the community, the basis of the current Mosque was built in 1890. Named the Mohammedan Mosque or the Shelley Street Mosque, it was soon ready for expansion and in 1915 it was rebuilt by a man from Bombay (Mumbai) called H. M. H. Essack Elias. The mosque, also known as the Lascar Temple, was renamed the Jamia Mosque by the Board of Trustees after the Second World War. The gateway that you are gazing up at is the oldest extant part of the mosque and has more of a classical European styling about it. Its greenish colouring is a prelude for the building that lies beyond. Walking up the path, a striking green building occupies centre stage. The fabulous Arabian ogee arches single it out as a truly unique building in the Hong Kong architectural tapestry. As you come around to the front of the masjid, you look up at the minaret and note the mixture of Indian and Moroccan architectural elements. You first go and meet with the Imam of the mosque, Mufti Abdul Zaman who greets you with a broad smile and warm handshake. His office is in the musafirkhana (rest house) that was built in 1929. The other side buildings of the mosque were an extension of the musafirkhana on one side and quarters for the Maulvi (Islamic scholar), a place for Wudu (ablution) and restrooms on the other side. The Mufti introduces you to the Caretaker, who is busily making repairs around the musafirkhana. Their kind demeanours reflect the charitable nature of the masjid and its mission to help the Muslim community. After talking for a few moments, you leave them to continue with their business and walk up to the beautiful façade of the mosque. The domed minaret reaches up into the sky above you, as you pass under it and remove your shoes. Standing in the foyer, you are faced with three elaborate Indian arched doorways. The walls hint at European classic panelling, and the style of the whole is a beautiful fusion of cultures. Stepping through the central door, you enter the musallah and tread on the soft carpeted floor. The large carpets make the floor into a wonderful eclectic mosaic. As you walk toward the miḥrāb, you are surrounded by windows topped with stained glass in their arches. Coming to the centre of the room, you stand directly under the qubba. 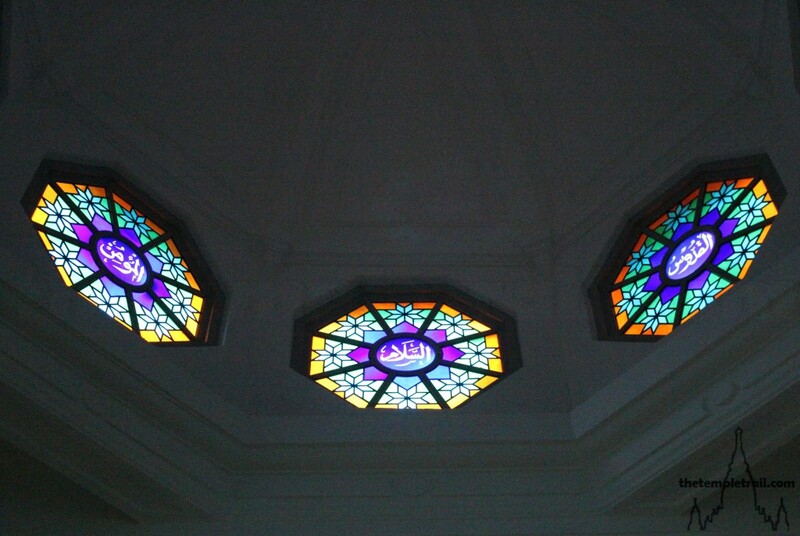 All around its interior are octagonal stained glass windows with Islamic phrases written in Arabic. The miḥrāb is more of an accentuated arrow here at Jamia Masjid. Either side of it are smaller niches in the same style. The Qibla wall is adorned with calligraphy and the mimbar is covered by a green cloth. 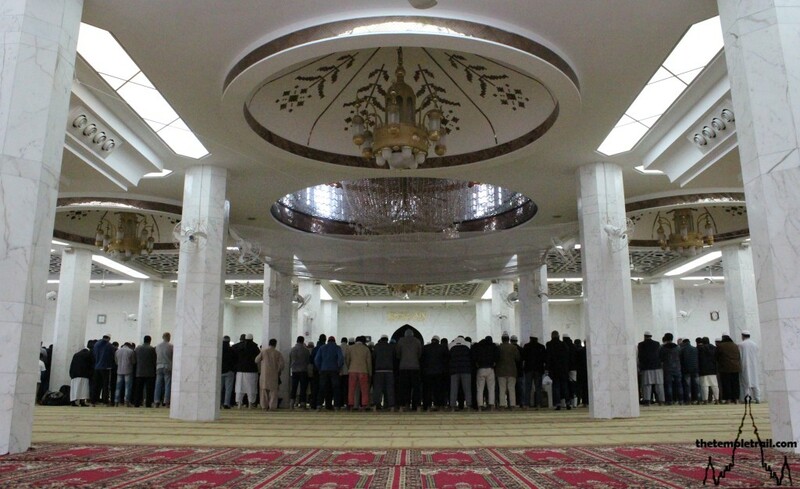 When the Imam gives his sermon on Friday, his congregation is of around 400 people. The title of Mufti is given to a scholar who can interpret and expound Sharia (divine law) and fiqh (jurisprudence or interpretation of Sharia). He does this by issuing fatwās (legal opinions). To qualify as a Mufti takes a lot of study and a profound knowledge of Islamic law. Returning to the front of the masjid and putting your shoes back on, you go and thank the Imam and caretaker before walking back around the beautiful building and heading back onto the escalator. 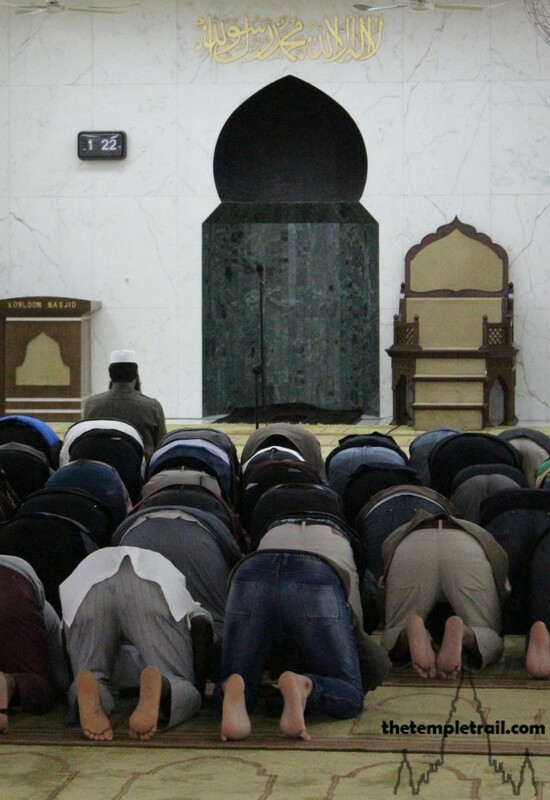 Both of the mosques have told you a story of the Muslims of Hong Kong. From their humble beginnings in the small mosque here on Shelley Street, through to the modern day community that require a number of mosques to accommodate them. 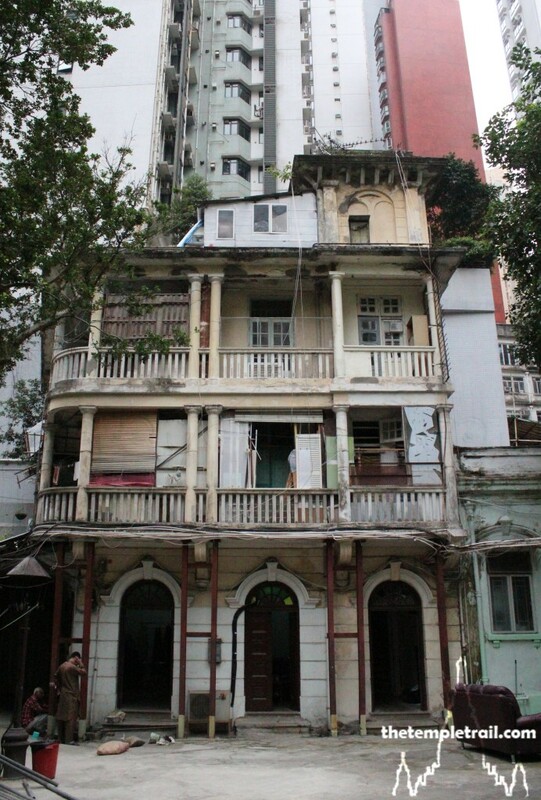 While Jamia Masjid is a symbol of where they have come from, Kowloon Masjid reflects where they are now. 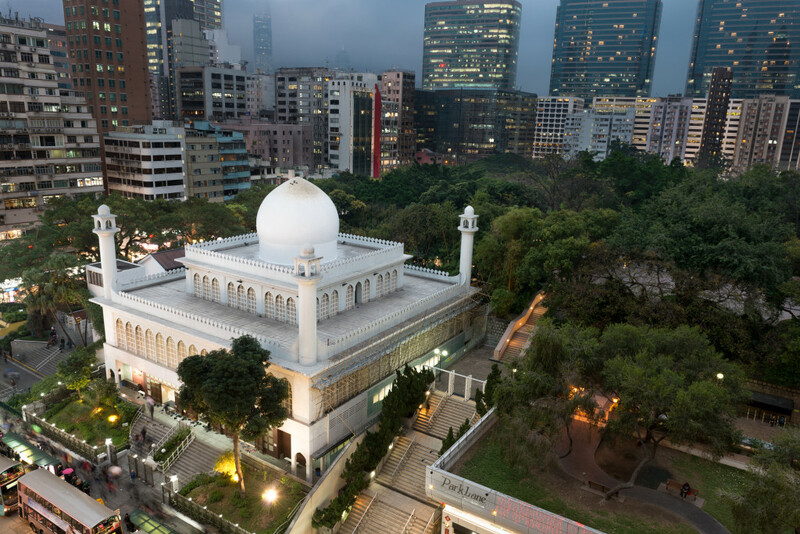 Having visited these two buildings, you have gained a greater knowledge of Hong Kong’s diverse spiritual scene and a deeper appreciation of the rich traditions of the Islamic faith. With gratitude to the Incorporated Trustees of the Islamic Community Fund of Hong Kong for facilitating visits inside both mosques. In particular, I would like to thank Mufti Muhammad Arshad, Mufti Abdul Zaman, the caretakers at both of the mosques, the members of Board of Trustees and the members of Kowloon Masjid Management Committee. Jazak Allahu Khayran.